Crust: Pulse dry ingredients for pie crust together in a food processor. Add butter and cut into flour mixture until crumbly. Crack your egg into a small bowl and slightly whisk, just enough to break the yolk. Add egg to the dough a small amount at a time. When egg is fully incorporated, pulse dough until it comes together in one large ball. If dough is too wet, add a very small amount of ice water (only a half teaspoon at a time), until dough comes together. Roll dough onto lightly floured surface, and separate into 2 sections. Wrap in plastic and chill for 2 hours. Preheat oven to 350°. Grease a 9 inch cake pan and line with parchment. Topping: Melt butter in a sauce pan. Add pecans and toss to coat. Add sugar, and cook over medium heat until sugar is completely dissolved and beginning to brown. Pour pecan mixture into greased cake pan, using a spatula to completely cover the bottom of the pan. Filling: Whisk together all ingredients, save for chopped pecans. When fully incorporated, gently fold in pecans. Assembly: Roll one of the dough balls out to about 1/8 inch thick. 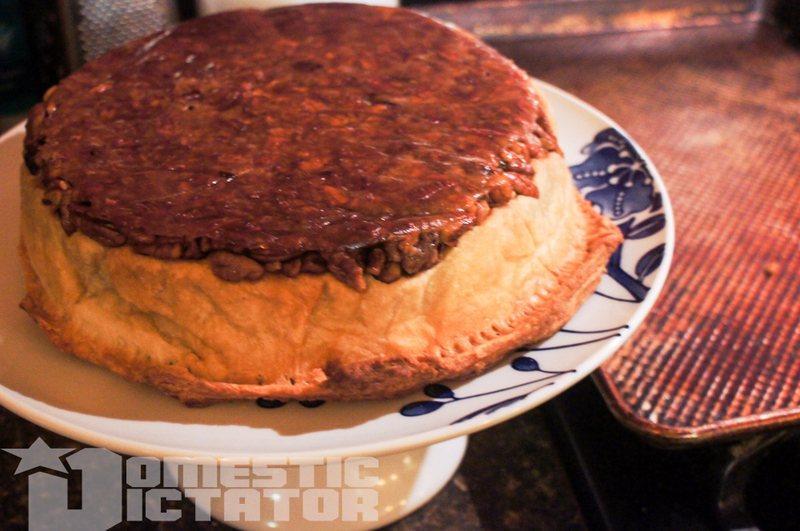 Lay it in the cake pan, over the topping. Pour filling into dough. Roll out second dough ball to the same thickness, and lay overtop filling. Crimp the edges and cut several small slits in the top of the pie. Bake for 30 minutes. If pie crust is browning quickly, tent with foil. Turn off oven and let pie rest in oven for 30 minutes.